El cobro se realizará al 100% 7 días antes de la llegada del grupo. En caso de que no se pueda realizar el cobro, la reserva quedará cancelada. Break N 'Bed combines shared and private rooms in order to offer shelter to various traveler profiles. We offer a very friendly customer service, we want our guests to feel at home. In addition, our privileged geographical situation allows us to be connected to the most emblematic parts of Barcelona, such as the center. 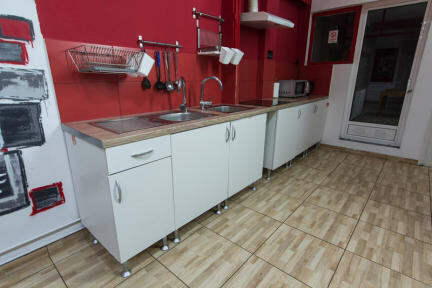 There is a small sun terrace and a shared kitchen at the property, as well as a TV lounge. A laundry, ironing and dry cleaning service is available. 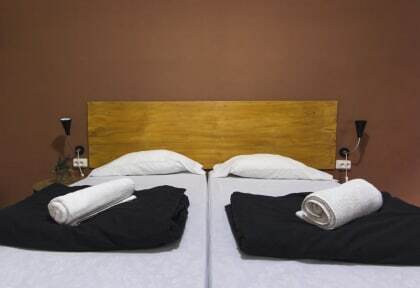 Break N 'Bed is located on a street that climbs from the Avinguda Paral.lel called Carrer Ricart. We are isolated from the hustle and bustle of downtown but not far from it, since the Poble Sec neighborhood is well located but residential. In our shared rooms, we offer a service that prioritizes the guest's privacy within the shared space they are living in. As for the private rooms, they are spacious and cozy. In case that on our part we can offer anything that gives added value to the stay, we have reception 24 hours a day to meet the needs of our guests. All rooms and dormitories feature hardwood floors. Rooms come with a chest of drawers and dormitories have storage drawers under the bunk beds.